Israeli and Palestinian officials said on Tuesday the three-month-old peace talks pressed on them by Washington are going nowhere, painting a grim picture for a visit this week by U.S. Secretary of State John Kerry. Few details have emerged from negotiating sessions held at unannounced times and at secret locations in line with pledges to keep a lid on leaks. But both sides have been airing their frustration over a lack of progress in the U.S.-brokered talks aimed at resolving core issues such as the borders of a Palestinian state, security arrangements, the future of Israeli settlements in occupied territory and the fate of Palestinian refugees. With both sides already trading blame over the absence of any sign of movement in the negotiations, Kerry will hold separate meetings on Wednesday with Netanyahu and Abbas. On the sidelines of the peace talks, Israel has released half of the 104 Palestinian prisoners it pledged to free under a deal Kerry brokered to draw Abbas back to negotiations after a three-year break over Israeli settlement-building. Israel says continued housing construction in settlements, in areas it intends to keep in any peace accord, was part of those understandings, which led to the return home of long-serving Palestinian inmates convicted of killing Israelis. In tandem with the release of 26 men last week, Israel pressed ahead with plans to build 3,500 more settler homes in the West Bank, a move widely seen as an attempt by Netanyahu to placate hardliners in his government. Nabil Abu Rdeineh, an Abbas spokesman, condemned the settlement campaign but said Palestinians remained committed to the negotiations. Netanyahu accused the Palestinians of reneging on what he said was an agreed prisoners-settlements link. “If they can't even ... stand beside and behind the agreements that we had, that we release prisoners but we continue building, then how can I see that they'll actually stand by the larger issues?” he said in an interview with the Israel-based i24 television news channel. Abbas, speaking to his Fatah party on Sunday, voiced opposition to any such linkage, cautioning that “this equation could blow up the talks” and “there could be tensions soon”. The settlements that Israel has built in the West Bank and East Jerusalem are considered illegal by most countries. Israel cites historical and biblical links to the areas, where about 500,000 Israelis now live alongside 2.5 million Palestinians. Israeli media on Monday reported that Kerry, who has given the sides nine months to reach a deal, plans in January to introduce a peace proposal if no major progress is made. 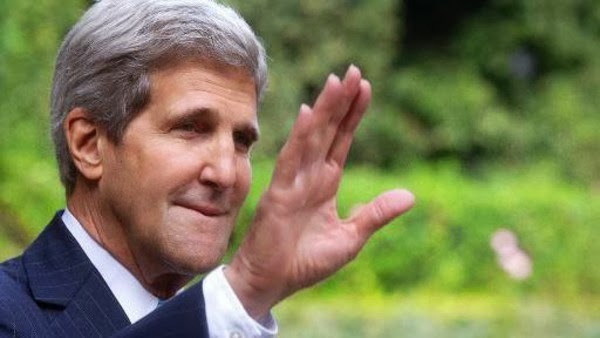 At a news conference in Riyadh on Monday, Kerry said there was no such plan “at this point in time”. He has spoken publicly of possible U.S. bridging proposals if no major progress is made.